A friend asked me to write a blog about Annette Funicello, who died earlier this week. We met her on TV when The Mickey Mouse Club first aired in 1955. It’s hard to describe to generations who always have had TV and have multiple 24/7 channels what this show meant to us back then. It was in black and white, or gray, as my kids used to call it, because we didn’t have color TV yet. Amazing, isn’t it? The Mickey Mouse Club was on every day after school and we waited eagerly for it every day, like clockwork. If you missed it, you missed it. No videotape or DVR. Probably not even reruns. This was a variety show for kids in the days of Ed Sullivan, Milton Berle and numerous adult or family variety shows. This one was just for us. We also weren’t as sophisticated as 9 & 10 year olds today. Unless you had older brothers or sisters, you weren’t really exposed to the teenage things. By some odd coincidence, almost all of my friends were the oldest in their family, so we were pretty much kids. We didn’t hit puberty as early, we didn’t dress like small adults, and we didn’t talk about adult things very much. The Mickey Mouse Club was part of the magic that was Walt Disney. It was a world of imagination and fantasy and innocence that we loved. 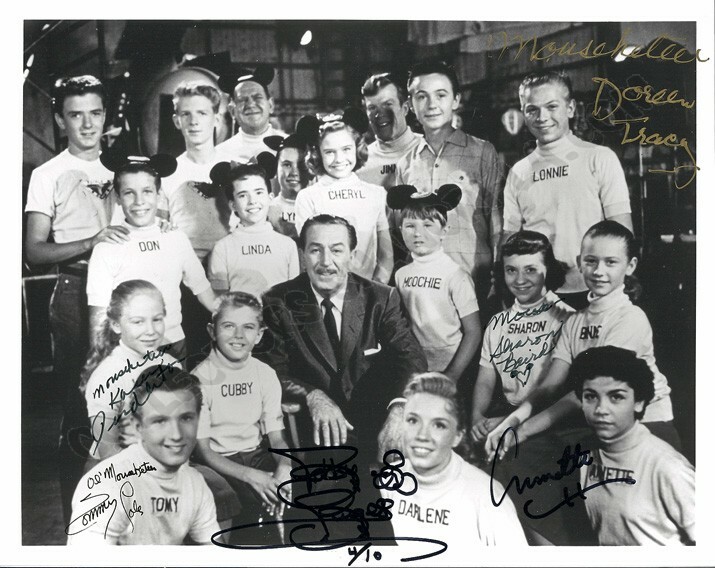 I found this photo online of the Mouseketeers from those days. It seems so silly today that these kids clowned around with mouse ears, singing and dancing for us. Annette was adorable, a sweetheart both inside and out. You always knew that. She stood out from the rest from the beginning. One of my favorite things on the show were the serials, continuing “dramas” featuring Annette, Tim Considine, Tommy Kirk. We couldn’t miss an episode of “Spin & Marty,” “The Hardy Boys,” “Corky and White Shadow.” The serials were fun, starring kids our age or a little older. They were the perfect way for us to have star crushes. Who didn’t think Tim Considine was just way too cute and Tommy Kirk was so funny and fun. And then there was Annette. I’m sure there were boys our age who were still watching The Mickey Mouse Club long after they had outgrown it just to see her. This Mousketeer was blossoming and it wasn’t hard to see what the boys were watching. She graduated on to her Beach Party movies, where that fully developed body and her singing were on full display. But, before that, she was the Mouseketeer all the boys loved and all the girls wanted to be. Always sweet. We all outgrew the show and moved on to the boys and girls in our real lives, but those days with The Mickey Mouse Club are special memories. Who doesn’t hear that music start up and begin to sing…M-I-C-K-E-Y M-O-U-S-E. We really did have sweet childhoods way back then.